Too old to play the drums??? 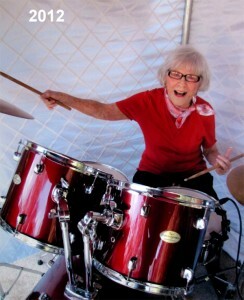 I’ve decided at the ripe old age of 56 that I am going to teach myself how to play the drums. You see we just bought a drum set for our 16 year old son’s recent birthday. I played acoustic guitar a bit when I was in high school. I had hoped to be able to play an electric guitar by the time I was 50, but life happened. Now my son, who has taught himself how to play guitar, is teaching himself how to play the drums. I would learn how to play guitar now, but then I would have to have short fingernails, and that ain’t happening. Maybe if I watch enough YouTube videos, I’ll be able to play by the time I’m 60! It worked for me for learning how to contour my face. Hmmm, we’ll just have to wait and see.